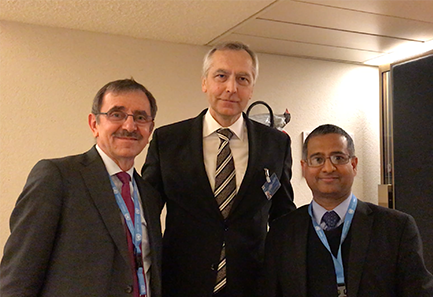 At the end of the «Panel on Freedom of Religion or Belief: Toward an Agenda for Implementation» hosted at the Palais des Nations in Geneva, the Secretary General, Dr. Liviu Olteanu met for the third time with Dr. Jan FIGEL, «the EU Special Envoy for the promotion of freedom of religion or belief outside the EU» and with Dr. Ahmed SHAHEED, «the UN Special Rapporteur on freedom of religion or belief» and thanked their Excellences for their interesting and practical keynote addresses and for their important international commitment on freedom of religion or belief. He expressed his appreciation for their prominence as international defenders; they have been invited to continue the cooperation started years ago, between the EU and the AIDLR., Dr Olteanu recalled the special collaboration between the former Special Rapporteur on FoRB, Dr. Heiner Bielefeldt, and the AIDLR at the international conferences organized by the AIDLR, with the hope that this relationship would continue between the new Special Rapporteur, Dr. Shaheed, and the AIDLR. Photo: H.E. Dr. Jan FIGEL the EU Special Envoy for the promotion of freedom of religion or belief outside the EU, Dr. Liviu Olteanu, Secretary General of the AIDLR and H.E. Dr. Ahmed Shaheed, the UN Special Rapporteur on freedom of religion or belief, at Palais des Nations in Geneva.